Those are words from Nziza Pachal Rufutu, a 28-year-old woman working as a biomedical engineering equipment technician at Bugando Medical Centre (Bugando) in Mwanza, Tanzania. She is responsible for installing medical equipment and performing preventive maintenance and repairs at one of the largest and most specialized hospitals in the country. Nziza’s role is critical in ensuring equipment is functioning properly so that the hospital can provide quality healthcare services. From a young age, Nziza excelled in science classes. After finishing her A-levels (similar to the Advanced Placement programs in the US), Nziza considered a career in engineering. Her brother, who was at University studying to become an engineer himself, introduced her to the field of biomedical engineering. She realized that this field would allow her to link her interests in biology and medicine with engineering principles to help others. Nziza embodies these attributes, and has been committed to improving Bugando since she first joined the hospital. For example, she worked with the engineering department and the Touch team to provide guidance on the equipment needed to enhance cardiology services at the hospital. After this initial project with Touch, Nziza became a member of Touch’s Healthcare Technology Management Improvement team in May. Through the Healthcare Technology Management program, Nziza has taken on the role of Key Performance Indicator (KPI) Champion at Bugando. If measured on a regular basis, KPIs can help engineers understand when large machines are not functioning as intended. In her role as a KPI Champion, Nziza connects with her colleagues stationed at Bugando’s large machines (i.e. Oxygen Plants, Generator, Incinerator), and monitors the KPIs for each machine. This allows her to respond immediately to any issues, before equipment downtime can affect the quality of care at the hospital. Moving forward, Nziza wants to focus on skills training for the engineering department as well as equipment training for all healthcare workers at the hospital. She is proud to be a leader in our Healthcare Technology Management program and work together with other biomedical engineers to provide better healthcare services day-to-day to Bugando’s patients. After all, the hospital can’t function without equipment that is well maintained. 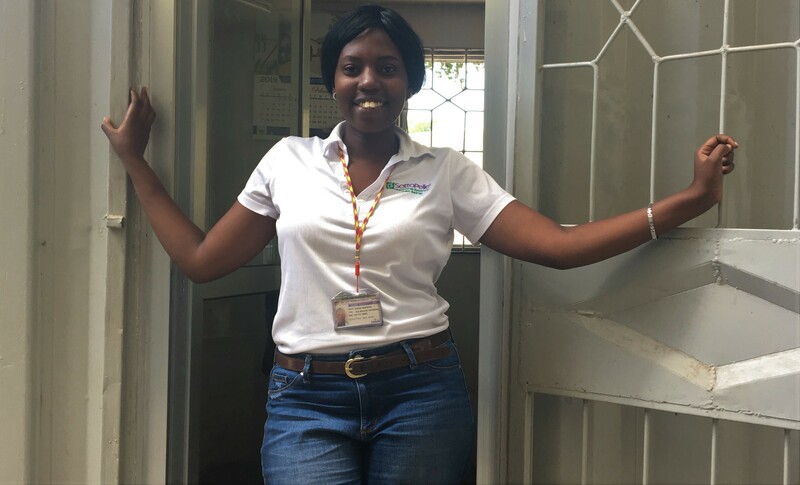 Caroline Mtani is boundlessly energized by her work at Sengerema Designated District Hospital (SDDH), a rural hospital in Tanzania. Caroline has worked at SDDH for her entire medical career, spanning nearly three decades. For the first twenty years, Caroline worked as a nurse midwife. 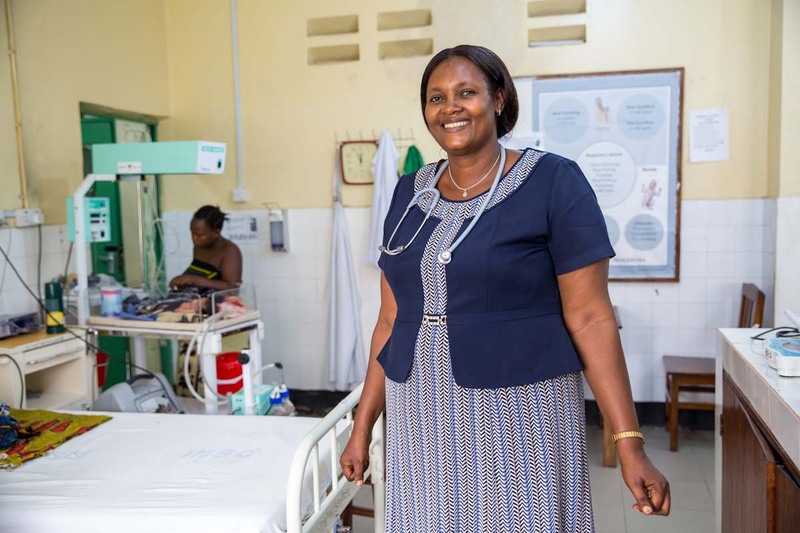 After the birth of her second child, and with support from her husband, Caroline decided to get her Assistant Medical Officer (AMO) diploma from the Catholic University of Health and Allied Sciences (CUHAS) in Mwanza, Tanzania. The AMO diploma allowed her to provide the full spectrum of maternal care, including C-sections. 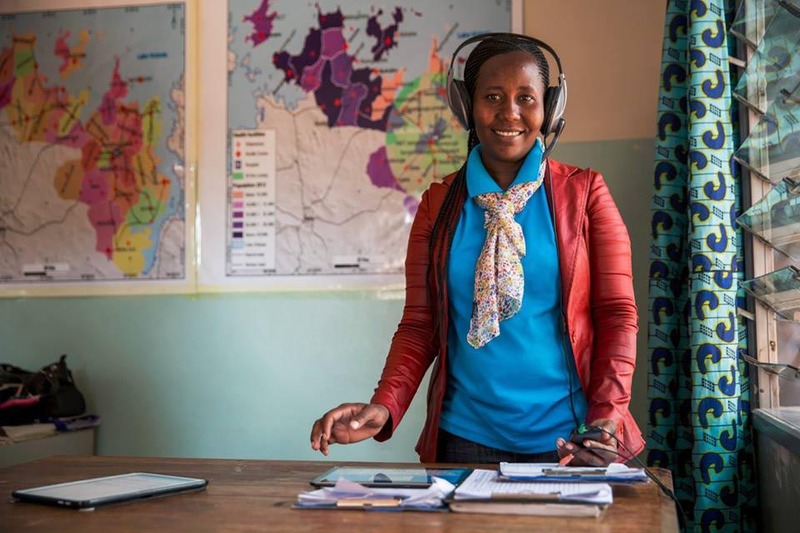 Deciding to pursue the advanced diploma was not an easy choice as it required her to leave her two young children and husband and move to Mwanza for two years of challenging studies. Caroline succeeded in obtaining her diploma and returned to work with SDDH to provide care to mothers, newborns, and other patients in this underserved area. Touch first partnered with SDDH in 2013. Tanzania continues to face a severe shortage of healthcare workers like doctors, nurse midwives and AMOs. Touch’s Treat & Train program tackles this gap in Tanzania’s health system. The Treat & Train Network connects hospitals and training facilities so that medical and nursing students can gain valuable hands-on experience during clinical rotations while also helping to provide better care to patients in under-resourced health facilities. With her wealth of knowledge about the Lake Zone’s medical facilities as well as a drive to bring impassioned healthcare workers to SDDH and the surrounding area, Caroline, the Co-coordinator of the program, is essential to the success of Treat & Train. Four years after Treat & Train began at SDDH, Caroline continues to pursue her goal of bringing positive change to her community through better healthcare. She is the National Facilitator for the Helping Babies Breathe training program at SDDH as well as the clinician in charge of maternal issues and the Supervisor of the Mobilizing Maternal Health Program. Caroline reflected that “Touch is like family”. These deep, trust-based relationships with our local partners are the heart of what we do at Touch and key to sustainable change. Caroline has facilitated a meaningful partnership between Touch and SDDH out of a personal drive to empower her own patients and her fellow healthcare workers. She continues to strive towards the goal of creating an ever stronger SDDH and Tanzanian health system, a goal we can proudly say we share and are working together to achieve. Dr. Harusha Simplice is the only obstetrician-gynecologist at Sengerema Council Designated Hospital, serving over 700,000 people. After becoming a general practitioner Dr. Harusha secured his specialist training through Touch’s Treat Train program, which improves medical education and patient care in the Lake Zone. A Burundian refugee forced to flee to Tanzania as a teenager, Dr. Harusha Simplice always knew he wanted to be a physician. According to his mother, at the ripe age of two he used to comfort his friends and family by reassuring them that one day he would be a doctor. His father also wanted to be a doctor, but he was never able to practice as he died in an accident two months after graduating from medical school. When Dr. Harusha was in his final year of schooling his mother was diagnosed with cervical cancer and died just a year later. It was his mother’s death that cemented his desire to help women and strive to one day become an obstetrician-gynecologist. After graduating, Dr. Harusha began practicing medicine at Sengerema Council Designated Hospital. Five years later, Dr. Harusha, now a father of two boys with another one on the way, decided he needed to find a way to receive specialized training to become an obstetrician-gynecologist and pursue his aspiration of helping women. At this point Dr. Harusha encountered Touch Foundation, just as we were in the process of expanding our Treat & Train program to Sengerema Council Designated Hospital. Through Dr. Harusha’s perseverance and partnership with Touch, he was able to receive the education required to specialize in Obstetrics and Gynecology. Today, Dr. Harusha is the only trained OBGYN at Sengerema Council Designated Hospital. This 300-bed hospital serves over 700,000 people and delivers about 25-30 babies per day. For Dr. Harusha, it is not uncommon to attend to multiple women giving birth in the same room with the help of just two nurses. In fact, in Tanzania the shortage of healthcare workers is a main contributor to the high maternal death rate. In early October, Dr. Harusha completed a training held by our partner MeduProf-S on SonoSite ultrasound machines in order to perform heart disease and obstetric ultrasound screenings during maternity checkups. For all of the clinicians present at the training, this was their first experience with an ultrasound machine. In the United States, women usually receive an initial screening at the beginning of their pregnancies to confirm a viable pregnancy. Most women in the United States will receive numerous ultrasounds throughout a pregnancy, and at least 1 anatomy screening at 20 weeks to ensure healthy development. Most Tanzanian women have never received an ultrasound screening during their pregnancy, but this is changing as women are increasingly requesting them and the technology is becoming more widely available. Dr. Harusha’s training, and others like it, will not only give women access to ultrasounds to ensure the health of their developing babies, but will also screen them for any heart anomalies, which can go undiagnosed until delivery, putting the mother at risk during labor. 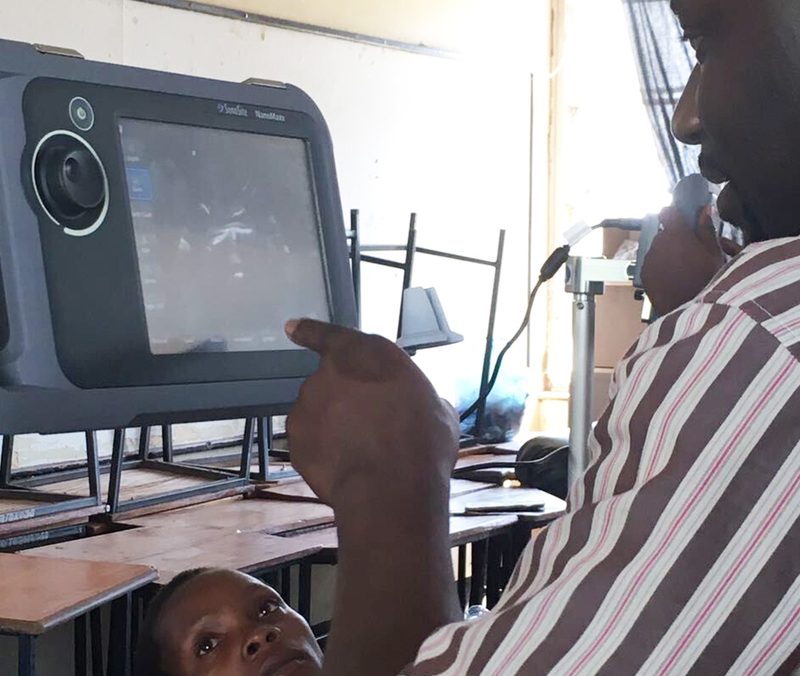 Following the training, the SonoSite ultrasound machine installed at Sengerema hospital, and three additional machines were installed in other high-risk area health centers. Dr. Harusha truly believes in the sustainability of the unique education model of Touch’s Treat & Train program. He continues to learn new skills which are valuable for him and also valuable to the medical students he is training and to the women he is attending to. For Dr. Harusha, continuing his education and partnership with Touch empowers him to achieve his goal of saving the lives of women and children. Five billion people live without access to safe, affordable surgical and anesthesia care. These operating room services are crucial to treating people with cardiovascular conditions, bone fractures, pregnancy complications, and many other health issues. If these services are inaccessible it can lead to an avoidable disability or premature death. This situation is far too common in Tanzania where surgical and anesthesia care is lacking and the country is facing a large shortage of healthcare workers with the needed skills. Allan Joel is an ambitious 29-year-old nurse anesthetist trained to meet all of a patient’s anesthesia needs before, during and after surgery or the delivery of a baby. Allan developed a passion for medicine in 1989, the year his father was diagnosed with diabetes. He witnessed his father suffer from inadequate medical care and decided at a young age to pursue nursing so that he could help his father and others in need. After graduating from nursing school, he applied for a nurse midwifery position at Sengerema Hospital, a 325-bed rural hospital serving 800,000 Tanzanians. Limited funding and resources at the hospital prevented Allan from getting a position and forced him to reconsider his career. Touch accepted Allan Joel’s application to work as a medical scribe aiding the Treat & Train program. While Allan worked as a medical scribe, he was able to spend all of his free time volunteering in the ICU and operating theaters at Sengerema Hospital. In the ICU and operating theaters, Allan was exposed to anesthesiology and realized the impact he could have on patients’ lives in this field. 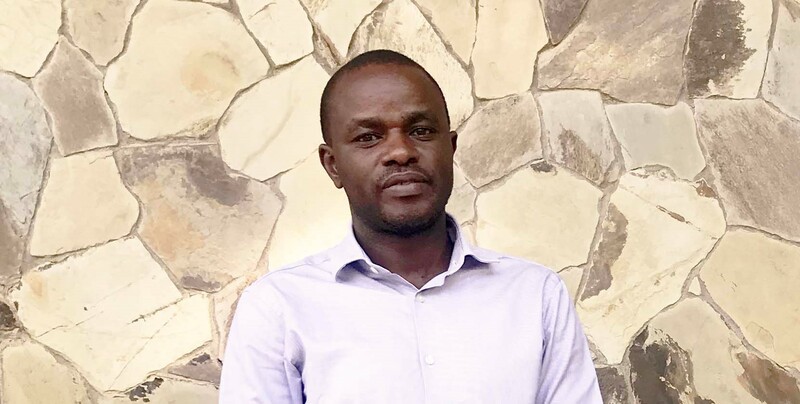 Inspired to learn the skills necessary to provide life support in a safe surgical environment, Allan applied for a one-year nurse anesthetist certification at Bugando Medical Centre. 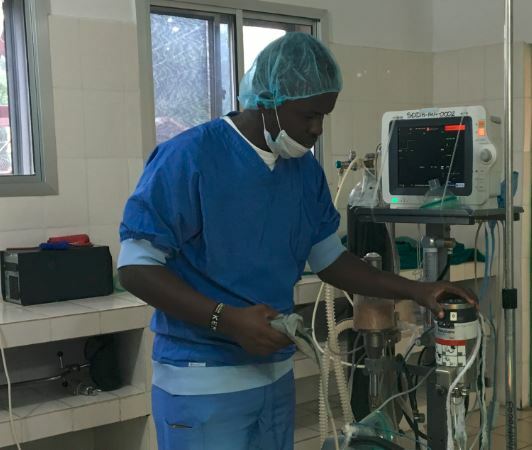 With the help of a Touch-funded grant, he graduated in September 2016 and promptly returned to Sengerema Hospital to begin working in the operating room. Mortality and morbidity related to anesthesia and surgery are all too common in Tanzania. We recognize the importance of a safe and sterile surgical environment to protect everyone, including patients, healthcare workers and students, from infection, injury, and other harm. Touch, together with hardworking individuals like Allan Joel, is working to improve access to safe surgical care and save lives at Sengerema Hospital and our other partner health facilities. With Touch’s help, Allan was able to start a career in the field of anesthesiology. Although Allan’s work comes with many challenges, including working with only a limited number of trained specialists and equipment, his dynamic drive to find solutions has made him an integral part of the hospital. He has already devoted seven years of his life to improving the care of patients and aims to return to school next year to qualify as an Assistant Anesthesiologist. Touch is proud to support the ambition of young healthcare workers and improve the lives of Tanzanians by providing greater access to quality skilled providers and safe surgical care.